US Troop Surge Planned For Iraq……. – The Tundra Tabloids……. US Troop Surge Planned For Iraq……. US president, George W. Bush, announced early this morning (Finnish time) to the American people that he will ask Congress for additional troops to help implement his new strategy for the war in Iraq. He insisted that the 20 000 additional troops will help the Iraqis secure Baghdad, while giving a “breathing space” for the elected Iraqi government to help convince its people that it is able to provide for both their security and future. This is a major gamble by president Bush, who has clearly put the question of support for the troops, into the hands of the newly elected (Democrat majority) US congress. 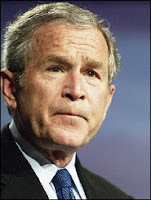 The Dems came out strongly against the new plan after Bush’s televised address, stating that his strategy goes against the advice of some of the US’s leading generals. Not only is there is a clear division over the planned “troop surge” between the Democrats and the Republicans, but also within the ranks of the Republicans as well. Top conservative commentators are doubting the success of the plan, saying that it’s “too little too late”. Personally I must admit to not being overwhelmingly convinced that 20 000 extra soldiers will turn the tide, but then again, perhaps it’s plausible that some tangible gains can be made from the additional forces. Previous Post Previous Post Senior Al-Qaida Leader in Somalia Possibly Killed……. Next Post Next Post Sáid To Totten: He is Watching Us…….